HockeyPucks hiking and highpointing: Burns Hill - Milford NH - 751 Ft.
From the Milford Oval take Osgood Street south and look for the hiker sign and Mullen Rd on your right. Follow the dirt Mullen road 0.2 miles to a cul-de-sac at it's end. DESCRIPTION: From the Hitchner Picnic area and pavilion at the end of Mullen road follow the white blazed trail in a westerly direction. The un-named trail is well marked with white blazes and Hitchner Town forest signs making it easy to navigate. Follow the white blazes a few hundred feet to the junction with the gray trail. The white trail branches left and follows a well crafted rock wall through a mountain laurel forest, turns right, crosses a foot bridge then merges with the upper junction of the grey trail. After the merge cross a wet and muddy section then bear right on the East Summit Trail and begin a short and steep ascent along a single track trail to Burns hill. You soon reach a ridge and travel through open woods to the summit. The summit is marked with a small cairn and offers minimal views in the direction of Pack Monadnock and North Pack Monadnock. Descend the way you cam or take the longer 4x4 carriage road back down. 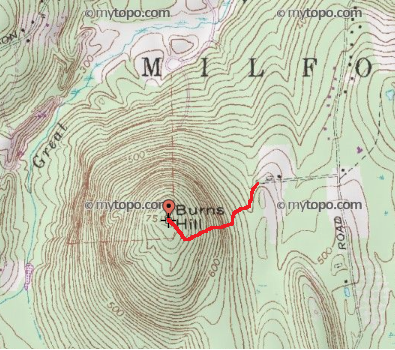 Burns Hill is not a high peak in southern New Hampshire but contains a 300 Ft. saddle which makes it the 35th most prominent summit in Hillsborough county (if anyone is counting) and a very enjoyable hike. The trails are easy to follow and it's short distance makes it a great hike for children.